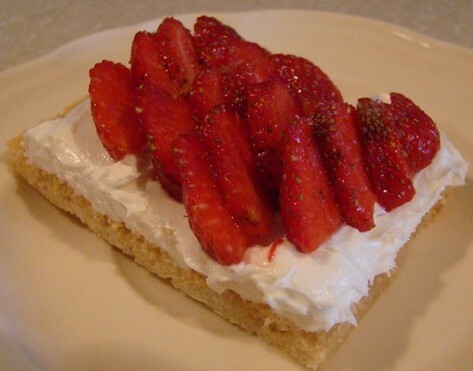 FRESH STRAWBERRY DESERT PIZZA – my very first blog post, May 2014 | Cook, Party, Enjoy! I’ll be writing about my recipes, cooking and my life experiences for my family, friends, customers, and anyone else who is interested. 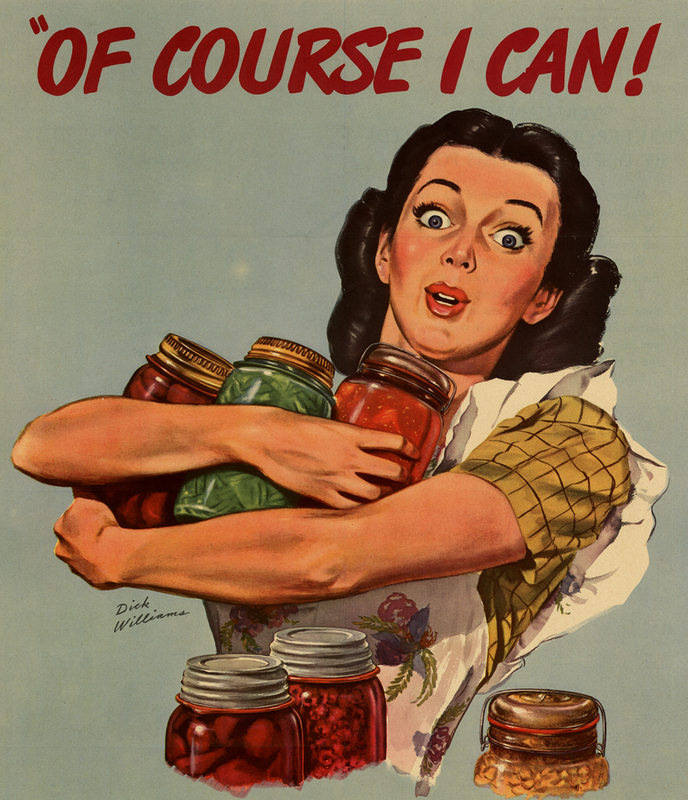 I have so many recipes, entertaining ideas, life lessons all learned over the past 60+++ years and I want to share it all with you. Just like I promised ya’all, I am writing up my recipe for the fruit pizza with the cake mix cookie crust. The first time I had this delicious dessert was when we had dinner at our friend Terri’s house. It was so good I asked her for the recipe and she shared it with me. I love getting recipes from friends especially after I have tried it and know it is really good. Terri’s recipe for fruit pizza called for mascarpone cheese which is pretty expensive and it is so very thick and rich so I started thinking about using cream cheese for the filling. I came up with what I think is a pretty good recipe. I also changed the cookie base her recipe called for – that sugar cookie roll from the grocery – I like to use cake mix instead, it is so much less expensive, it’s fresh, and it’s delicious. Also one more thing her’s was round and mine is a rectangle. Easier to cut and serve…. Strawberries are supposed to be the best they have been in years because of the cold wet winter but the yield is a little less according to Chesterfield Berry Farms here in Midlothian. 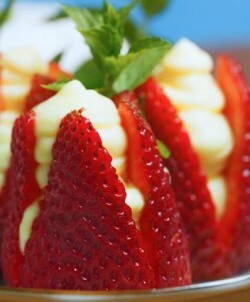 But I will be taking advantage of the farmer’s markets and making lots of recipes using strawberries. They have so much fiber. Bigger, sweeter, better than ever! Here is my revised recipe for a strawberry topped pizza with a cream cheese filling and a cake mix cookie crust. Round or retangle you won’t be disapointed! …consider this slice for dessert! I used a 9×13 pan and made mine for easy cutting and serving but you could make it round by using a pizza pan. Dollar Store has had some great pans for cookies and I bought some and they have really held up. I was surprised, the cookies cooked evenly and the pans do not discolor in the dishwasher. Yes, I do put just about everything into the dishwasher…. The bonus of these dollar pans is that you can give the pizza as a gift wrapped in basket wrap on the pan! To prepare the cookie dough for the base all you have to do is put in your mixing bowl one egg and the 1/2 cup of oil and using the paddle beat at medium speed until it becomes fluffy, then add the cake mix and beat until dough forms. If the dough is too dry just add a little water. The dough will not be sticky it will actually feel a little greasy but that is ok. Take the dough out of the bowl and press it into the pan you have chosen to use. You will want to press it pretty thin in the center area pushing the dough to the sides of the pan to make a rim. Cut off any excess and let your kids make some cookies or you can roll it into a log wrap it in plastic wrap and save it in your refrigerator to slice and make cookies in your toaster oven. (just slice, place on toaster oven pan lined with aluminum foil and bake in toaster oven at 35o degrees for 11 minutes) Back to your pizza crust. Bake it in oven 350 degrees for 11 minutes it will be lightly browned. ****While pizza crust is cooking wash out your mixing bowl and paddle so you can make the filling. Remove cookie crust from oven and let it cool. It needs to be completely cooled before you spread the cheese mixture on it. For the cheese filling mixture. In your clean mixing bowl using the paddle place the softened cream cheese and the sugar and mix until it gets fluffy and light. Add the milk and the pudding mix and mix some more until it starts to thicken. Add the vanilla and mix just to blend and put it in the fridge while you cut up the strawberries. 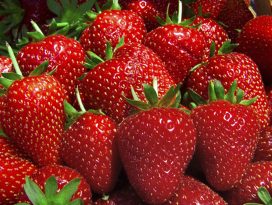 Wash the strawberries in cold water and pat dry with a paper towel. 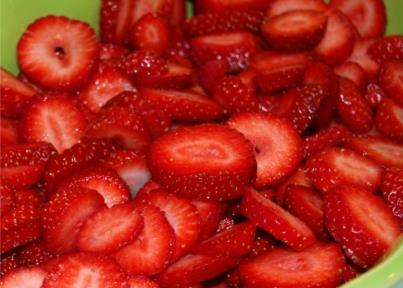 Wash the strawberries and pat dry with a paper towel and then slice into a bowl and set aside. Your cookie crust should be cooled now so you can spread the cheese filling over the crust smoothing it out to the sides of the crust. Now take your time and arrange your strawberry slices on top of the filling in rows, piled, circles whatever strikes your fancy. Eat as soon as the last strawberry is placed which is what happens here or cover with plastic wrap and refrigerate until you are ready to serve. Be creative…fruits that are delicious on this dessert are strawberries, fresh or canned peaches, bananas, kiwi, mandarin oranges canned or fresh, blueberries, and green or red seedless grapes are a few. 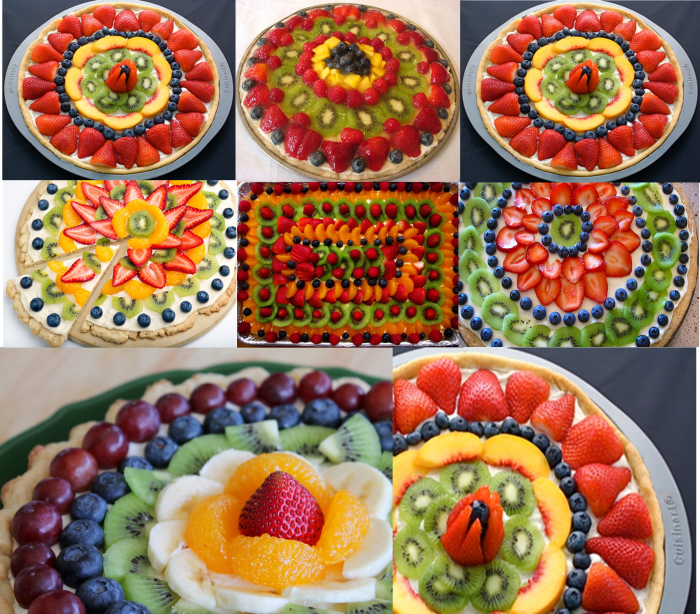 Start in the center creating your masterpiece and then continue out with your fruit. TIP: You may want to put a glaze on the strawberries, and apricot jam which has been thinned by heating in the microwave is a perfect glaze. Just brush it on with a silicone brush. Me I don’t glaze mine I like the tartness of the strawberries, the tang of the filling and the sweetness of the cookie crust. A perfect combination. If wrapped in plastic wrap the crust will get a little softer with time but it still tastes amazing… I just ate a piece today that I made on Tue for my daughter Jessica and it was delicious. I hope you will try this and that you and your family enjoy it as much as my family does. The filling is good for all kinds of delicious desserts and snacks so you might want to double the recipe and store in the refrigerator. …elegant bite size treat anytime. STUFFED STRAWBERRIES – You can stuff strawberries with the creamy cheese filling, just slice an x three quarters down into the top of strawberry exposing the hollow center and pipe the cream filling into the cavity of the berry.The cutting seems tedious but it is well worth the effort for the result. These strawberries are so beautiful. … cherry topped cheese cake snack. MOCK CHEESECAKE WITH CHERRY TOPPING — Top a graham cracker with the cheese filling and top with strawberries or you can make a double decker by topping one graham cracker cookie square with cream cheese filling and then add another cracker square and top that with cheese filling and then top with a spoonful of canned or homemade cherry pie filling. Tired of cream cheese frosting, try using this filling as a frosting in place of sugar based cream cheese frosting it is fluffy, tasty and less sugary. The uses are endless and it is so much better than that cheese cake filling they sell in the grocery store. You can store it in your fridge in a closed container just like you would that store bought kind. just pay attention to expiration on your ingredients and use that as your guideline as far as how long you can keep it in the fridge. One more great thing about this recipe is that it doesn’t cost much and there are no ingredients in it that you have to go to a specialty store to find. And the cake mix cookie crust recipe is what I use all the time to make cookies That are to die for. You imagine a cookie and you can add the ingredients and make it with cake mix. I’ll write up the recipe tomorrow for those cookies. I think I will love writing this blog. I love recipes and look forward to sharing and getting new and delicious recipes from you. I am going to write up my recipe for a variation of Shoney’s Strawberry Pie for my next post. I would love to hear from you. Let me know what you think.